A group of environmental advocates, federal and local officials and neighborhood residents gathered at the North Side park earlier this month to mark the grand opening of the restored riverfront near Montrose Avenue. The $5.6 million project by the U.S. Army Corps of Engineers and Chicago Park District involved regrading a section of the riverbank, removing invasive plant species, planting 128 native trees and 282 shrubs to combat erosion and installing a wood-chip trail along the water. 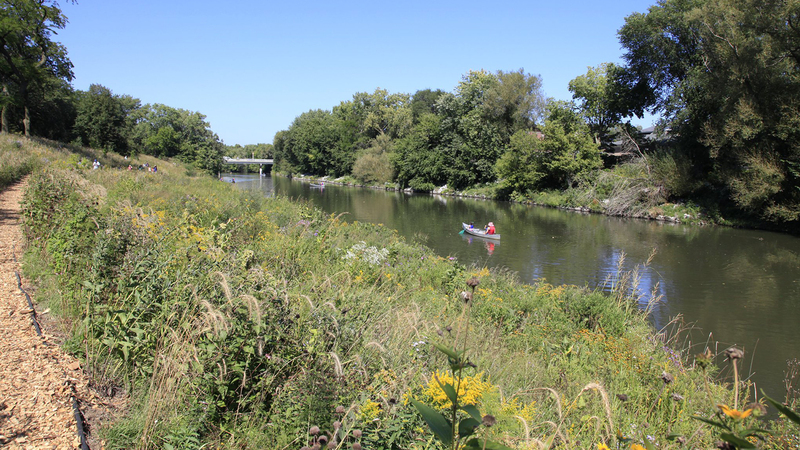 Although much of the work had been completed prior to the summer, officials kept the area closed to the public until Sept. 15 to allow new plants to grow properly, said Margaret Frisbie, executive director of the nonprofit Friends of the Chicago River. When Frisbie joined the organization in 2000, she said advocates and residents “dreamed” of cutting down the wall of invasive buckthorn near the river and replacing it with a natural area that provided access to the water. A strategy to do just that was outlined a year earlier in former Mayor Richard M. Daley’s Chicago River Corridor Development Plan. As part of a local-federal partnership program under former President Bill Clinton, city officials began working with the Army Corps and U.S. Fish and Wildlife Services to tackle the Horner Park project. But the partnership program dissolved after the election of former President George W. Bush, and the project stalled, Frisbie said. Although the Friends tried to keep it alive, Frisbie said it was volunteers with the Horner Park Advisory Council who prevented the project from dying. After the current version of the project began in April 2014, the Advisory Council worked with the Park District to organize public meetings and revise plans to preserve the maximum number of existing trees at the site. The grand opening also included a Native American ceremony to honor the rebirth of the riverfront, according to the Metropolitan Water Reclamation District of Greater Chicago, which designated a 2-acre parcel of land for the project five years ago.